16 Days of Activism begins today across the world and in Pakistan. From 25 November (the International Day for the Elimination of Violence against Women) to 10 December (Human Rights Day), the 16 Days of Activism against Gender-Based Violence Campaign is a time to galvanize action to end violence against women and girls around the world. This years’ theme is to “End Gender-Based Violence in the World of Work”. Like the pathways we chose to end GBV may be many, there can be many interpretations of this theme too. For me, the first foundational pathway is "Education for Girls and Women" that alters our life chances, our responses, skills and narratives; in fact, women become the protectors at home and the work place as we have seen recently. An ancient stereotype notion is fully reversed for good reasons. These 15 Days we will pick up faces of young Women Leaders of Pakistan, the subalterns if you like, who are changing the course of our society. There are many more like them doing so as well but they are faceless; these have come to the forefront due to their deeds and images. Suhai Aziz Talpur is the Senior Superintendent Police who foiled the terror attack on the Chinese Consulate in Karachi just this week. She protected many human lives through her intelligent leadership, where all three attackers were killed in the gunfight with security forces. Innocent lives were lost too, but the larger damage was controlled. Suhai asked for more intelligent responses from the media to protect citizens and safer policies for locations of diplomatic missions. 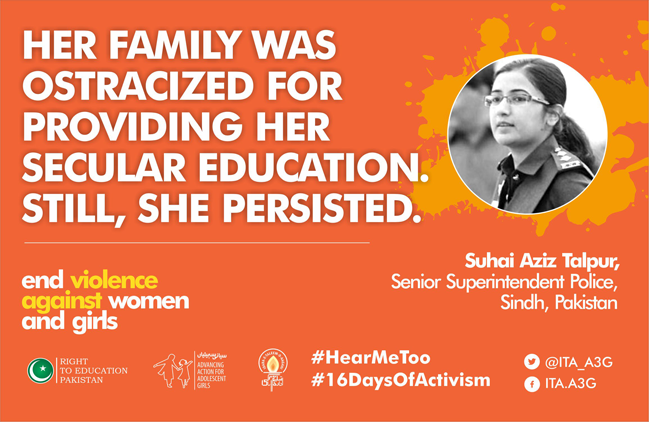 What lies behind Suhai’s acumen is her education and skills that she has gathered in her life thanks to her father’s support. Hailing from a lower middle-class background, she belongs to the village Bhai Khan Talpur in Tando Muhammad Khan district (one of the 29 districts of Sindh province). She is the daughter of activist nationalist parents and has famously said this week “When my parents decided to enroll me at a school, most of our relatives starting taunting my family. So much so, that my family had to leave our village and move to a nearby town” (The Express Tribune). Her family was ostracized for providing her secular education. Still, she persisted with hard work: from Sindhi literature, poetry to history, she managed to score high marks and also pass the CSS examinations to secure a position as a civil servant in Sindh in 2013. Suhai is the first woman from lower Sindh to join the police.